Linda Collins | Greene County News A new columbarium was delivered March 30 to Byron Cemetery. 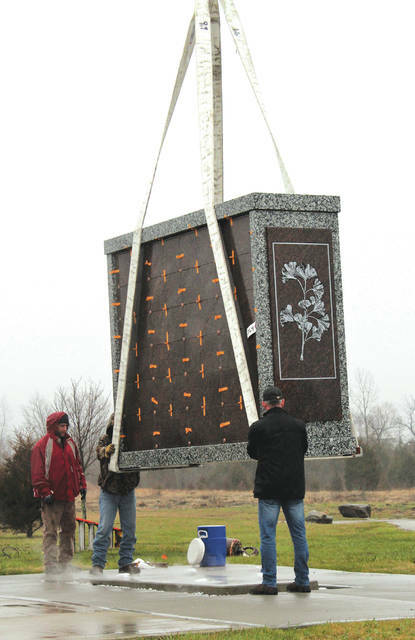 BATH TOWNSHIP — The Bath Township cemetery crew braved the unrelenting rain March 30 as Dodds Monuments delivered a new 16,000-pound columbarium to Byron Cemetery, 3256 Trebein Road, and a huge crane gently lowered it into place. The 8-foot-high Coldspring Columbarium, which was positioned on the south side of the two mausoleums at the cemetery, is a replicate of the columbarium that was purchased in 2003 and stands on the north side of the mausoleums. Bordered in a polished moonlight gray Rockville granite, the double-sided columbarium houses 96 cremation niches, with 48 niches on each side. Each niche, which is approximately an 11-inch square, is large enough to accommodate two small cremation urns, and the polished Carnelian granite front has ample space for a bronze nameplate that will include the date of birth and death of each cremated remains. According to Bath Township Cemetery Supervisor Teresa Phillips, a large plate with Ginkgo leaves embossed on it was placed on the front of the new columbarium as a way to identify it. She also noted that Dodds Monuments would be placing a front plate with embossed Buckeye leaves on the other columbarium later this spring. “Dodds did a super job. I am so happy with the way everything turned out,” Phillips said. In July 2017, Bath Township Trustees approved the purchase of the second columbarium from Dodds Monuments for $24,278, which included $20,778 for the columbarium and $3,500 for the use of the crane and installation fee. The township cemetery crew previously poured the concrete foundation for the new columbarium and extended the sidewalk around the other columbarium. Wrought iron benches have also been placed next to each columbarium for patrons visiting the cemetery. The two columbariums have the capacity to hold 384 cremated remains, which Phillips pointed out takes up considerably less space than full-size burial plots. “The popularity for cremation has grown significantly, and our availability in the current columbarium is decreasing. Thus, we are seeing the need for additional spaces in the near future to meet the needs of those choosing cremation over in-ground burials,” said Phillips. The cemetery grounds crew was also making final preparations last week, clearing gravesites and clipping grass, so the cemetery would look its best for the Easter holiday. Many patrons who frequent the cemetery decorated gravesite with pastel-colored spring bouquets that cladded the cemetery from front to back during the holiday weekend. “It’s quite a daunting task when you consider that we have over 6,000 burials to date,” Phillips said. https://www.fairborndailyherald.com/wp-content/uploads/sites/50/2018/04/web1_byroncemeterycolumbarium.jpgLinda Collins | Greene County News A new columbarium was delivered March 30 to Byron Cemetery.